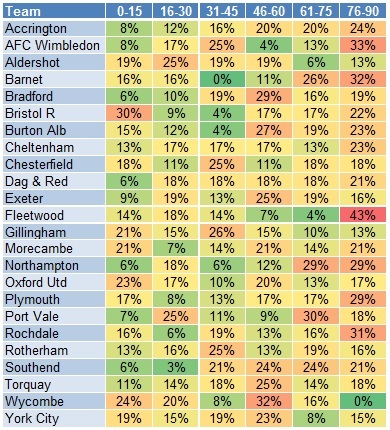 ← League 2: How do teams score the first goal? There are 690 league 2 goals (updated to 13/12/2012). There are many perspectives of analysis of goal scoring. This article will focus on the time at which goals are scored during match play. The analysis would be useful for coaches because the relationship between goal scoring and time would appear to be linked to physical conditioning and characteristics of different teams. I divided the 90 minutes into six 15-min periods. The following chart shows that there is a systematic and significant upward trend in the number of goals scored as time progressed. This is a support to previous research suggesting an increase in the frequency of goals scored as a match progresses (Jinshan et al., 1993; Reilly, 1996). Then we move on from the genearl perspective to the team perspective to analyse the goals. The following table shows the number of goals scored in six periods of different teams. The data were shown in a Red-Yellow-Green colour scale. That means, the higher number would be highlighted by red and the lower number would be highlighted by green for better visualisation of the data. Generally, most of the teams scored more goals in the second half which fit the general trend. 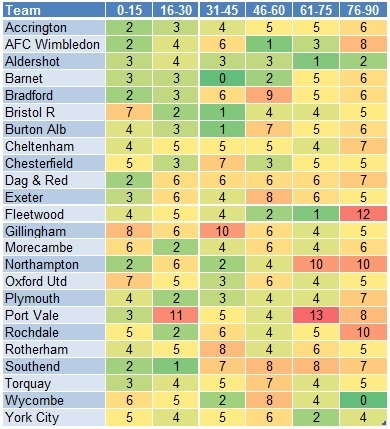 However, Aldershot is an exception as they scored the least goals in the last 30-min period among League 2. On the other hand, Fleetwood is expertised in scoring late goal in the last 15-min period. The 12 goals they scored is remarkably higher than the goals they scored in other periods. Northampton and Port Vale are strong in the last 30-min period as well. However, if we just count the goals scored, it is not showing the whole picture of analysis because stronger teams scored more goals. If we want to find the characteristics of the teams, we have to convert these data into percentage. For example, in the first 15-min of the game, Bristol Rovers scored 7 goals, same as Oxford United but less than Gillingham. A different table will show you a different picture. The following table shows the same set of data in percentage form. Bristol Rovers become the best team to score early goals which is obviously a characteristic of this team. Even Gillingham scored the most goals in this period, it is only 21% of their total number of goals. This percentage is less than Oxford United and Wycombe. The result of Fleetwood becomes more obvious. It seems that they tried to save energy in the 46-75 minutes by scoring only 11% of goals and then dominate the final 15 minutes in scoring 43% of their total goals. Wycombe shows the same trend in both halves that they scored most of their goals in the first 30 minutes. They are particularly weak in the last 15 minutes of the half. The possible explanation is the deterioration in physical condition of players is more serious in Wycombe. Accrington, Bradford and Southend have a similar characteristic because they all scored less than 20% of their goals in the first 30 minutes of the game. It would be a good strategy to start attacking early when other teams play against these three teams. Jinshan et al., 1993. Analysis of the goals in the 14th World Cup. In: J. C. a. A. S. T. Reilly, ed. Science and Football II. London: E. and F.N. Spon, pp. 203-205. Reilly, T., 1996. Motion analysis and physiological demands. In: T. Reilly, ed. Science and Soccer. London: E. and F.N.Spon, pp. 65-81. I am the founder of footballperformanceanalysis.com. I work as a performance analyst and football coach. With experience of working within professional football club, I am competent at using performance analysis products (SportsCode Gamebreaker and Prozone). I am a graduate of Football Studies in Southampton Solent University. I have in-depth knowledge of football tactics, coaching and football principles. My goal is to combine the knowledge of football and performance analysis. Posted on 14/12/2012, in Accrington, Aldershot, Bradford, Bristol Rovers, Fleetwood, Gillingham, League 2, Northampton, Oxford United, Port Vale, Southend, Wycombe and tagged Accrington, Aldershot, Bradford, Bristol Rovers, Fleetwood, Gillingham, League 2, Northampton, Oxford United, Port Vale, soccer, Southend, team perspective, Time Analysis, Wycombe. Bookmark the permalink. 2 Comments. Give me your email and I will give you my analysis. What is “Zone 14” in football?